Do you have 3.5 IN red ribbon? Sorry, we do not. The widest ribbon we carry is 2.5 inches. Are you down to the wire during Christmas time? It's Christmas Eve and you totally forgot about all of those presents in the attic you forgot to wrap, didn't you. Have no fear! Christmas Ribbon will come to your rescue (cue superman music)! Whether you're a procrastinator or like to get your gift shopping done in August, this christmas giftwrap will decorate any and all presents perfectly! This ribbon can even work by itself. Don’t have time to get all of those gift bags, boxes, or wrapping paper? Tie this ribbon into a cute bow and voila! Your present is ready for giving! 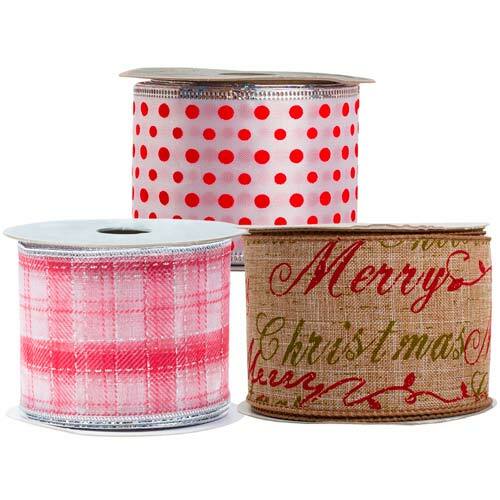 Christmas Ribbon is available in 3 yard and 10 yard spools. From 3/8 inches to 2 1/2 inches wide! With over a dozen different holiday colors, you'll have no problem picking a favorite. Choose red and green for a traditional look. Make your gifts even more elegant with our Silver and Gold ribbon. Or go literal with our 'Merry Christmas' ribbon!